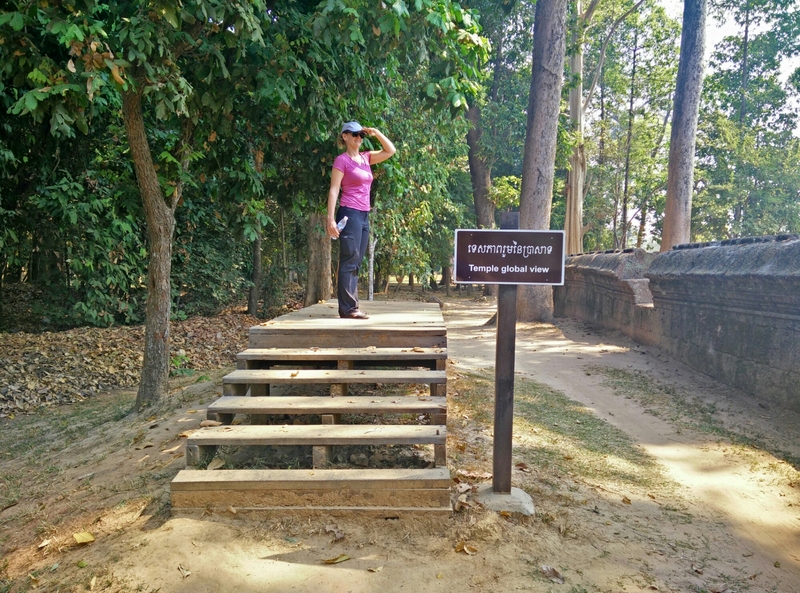 We had one day left in our three-day pass to Angkor Wat, so we set out for the more distant temples and ruins in hope there would be more carvings than cameras. 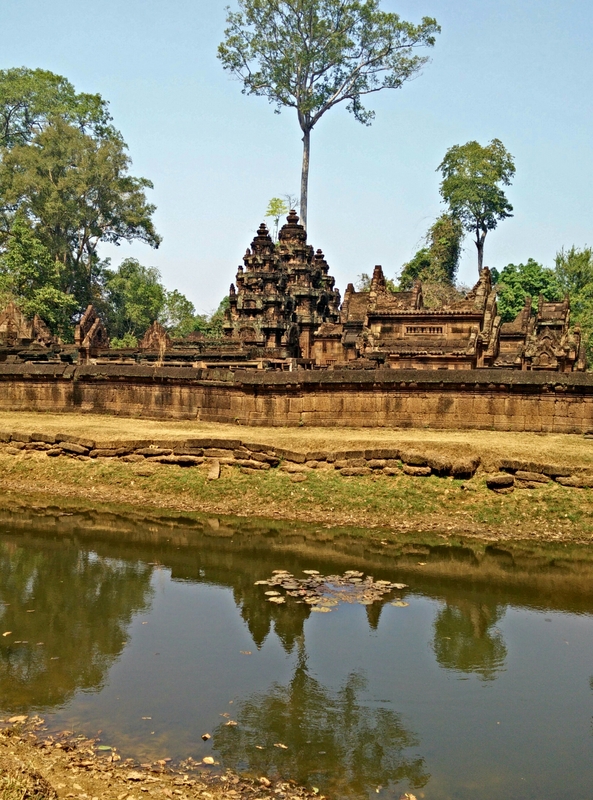 We arrived at a well curated Banteay Srei, known as the Citadel of Women or Beauty and dedicated to the Hindu god Shiva. Supported by Swiss aid, the ruins have a cloak room, restaurants and shops which are missing at larger sites near Angkor – for better and worse. 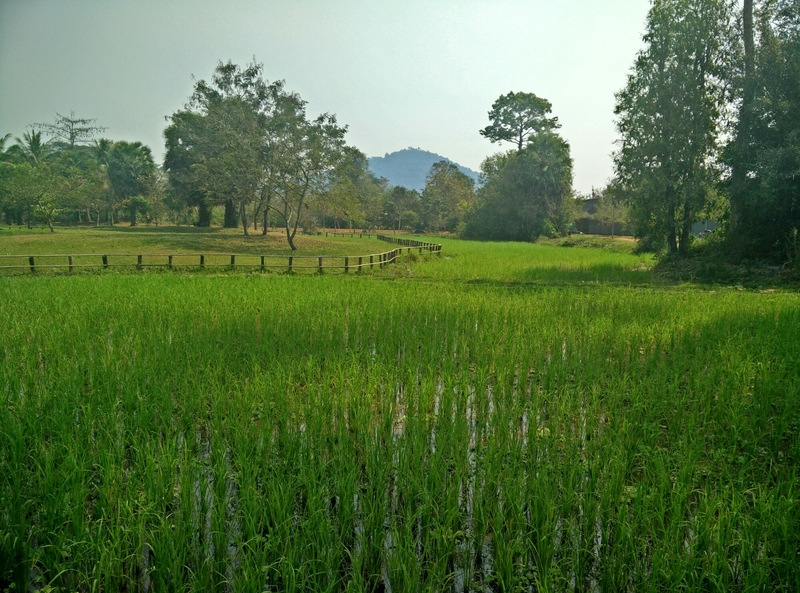 For better, Banteay Srei has conservation lands surrounding it, with local farmers, water buffalo, chickens and the like which make it a peaceful setting. That’s right – Hey, Mr Handsome Man! 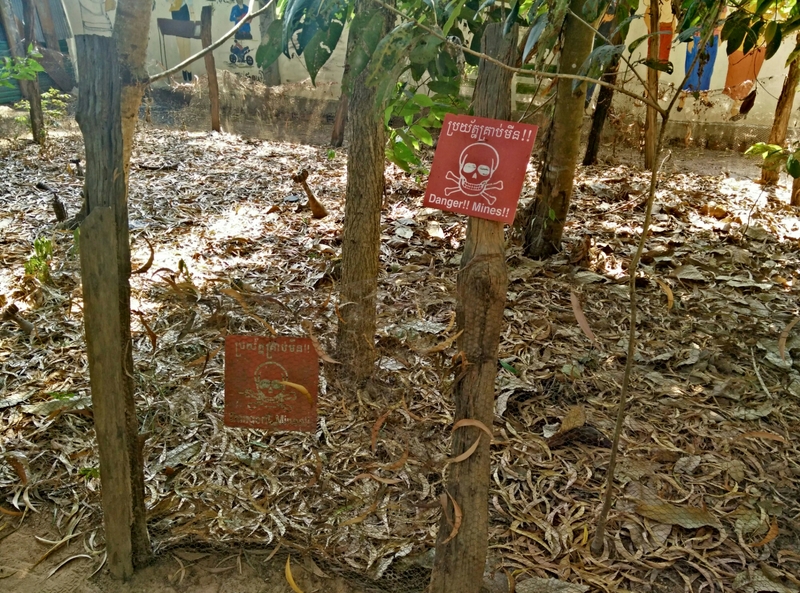 We also went to the Cambodian Landmine museum, to show respect for more recent history. As my dad had pointed out prior, the US was responsible for intensive air bombing campaigns over Laos and Cambodia in 1969. 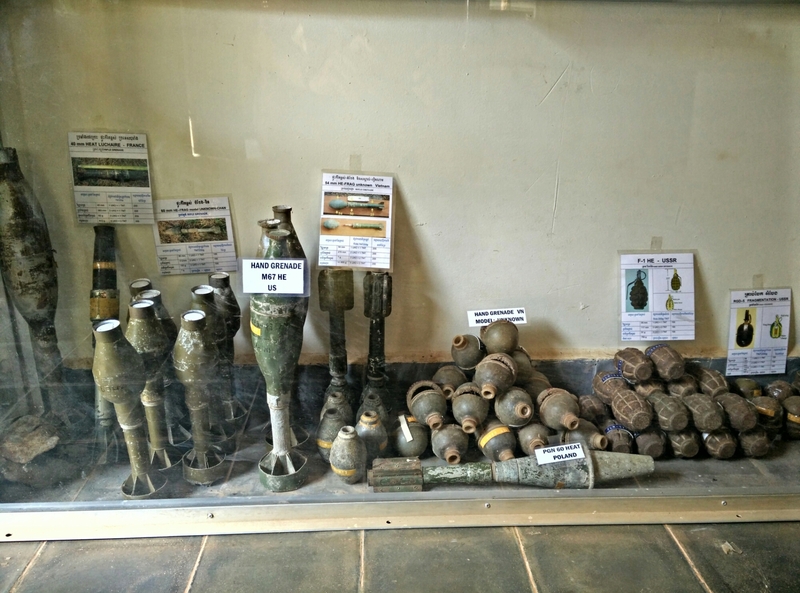 The museum had remnants of these bombs and primarily focused on the problem of land mines and land mine removal. It was overwhelming and sad to see. I’d been reading First they killed my father about the history of Cambodia and it is painful to imagine such recent war and genocide. I found myself reassessing the age of our hotel staff, local restaurant workers and others in terms of how old they’d been when the Khmer Rouge was in power. As a driver pointed out on the way to the temples, Cambodia only started stabilizing in 1999 and tourists coming more since then. And were Cambodians coming back yet? The local paper still reports on daily trials related to the Khmer Rouge, and that past suddenly didn’t seem so distant. 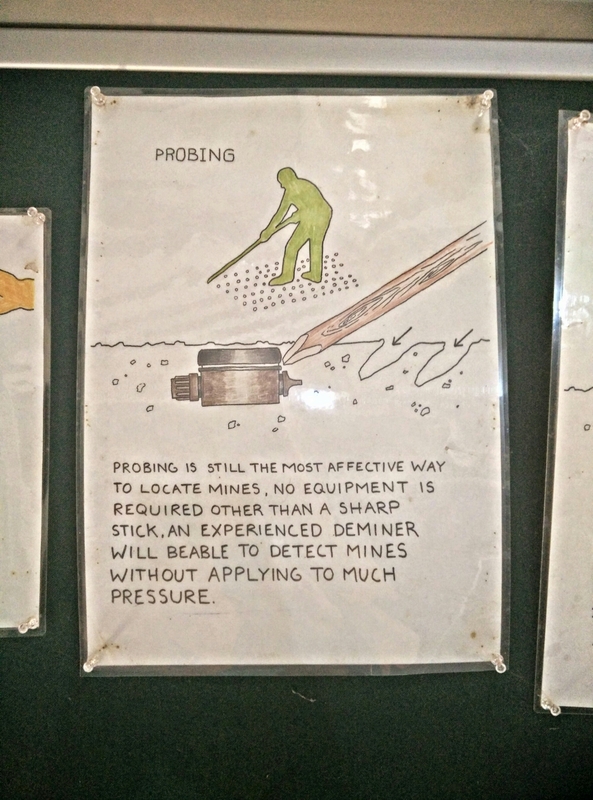 The day following our visit to the museum, the paper reported a farmer was killed by a landmine. Thirty years in the past seem remarkably present. Processing the glory of Angkor Wat’s warring empire of the 1100s, its disappearance in the late 1300s, the American bombings starting in 1969, the Khmer Rouge reign from 1970-5, the fighting and chaos which followed…maybe it can’t still be processed. We tried, while walking around that night, to understand why we glorify temples built by slave labor to ancient warring empires and why we pay to visit museums decrying bombings we carried out. I wondered how long tourist hotels and restaurants will exponentially grow in a country that 30 years ago killed professors, doctors and anyone seeming foreign while aspiring to notions of equality and communalism. Maybe the answers are back in Thailand along the path to the Buddhist monastery and shrine. Maybe they are all concealed in the same jungle that obscured Angkor Wat from its decline in the late 1300s to its “rediscovery” in the 1860s. Maybe…. Tom’s dreaminess is known worldwide.